Philip Kerr’s The Lady from Zagreb (Putnam) opens on the French Riviera, in 1956. But that’s just prologue; the story proper begins in the summer of 1942, in Berlin. Bernie Gunther, a captain in the SD (the Nazi security service, or Sicherheitdienst) has been assigned to the Berlin police, investigating homicides and other serious crimes. But Bernie, despite his barely veiled cynicism and smart mouth, has shown a useful talent for delicate inquiries and judicious solutions on behalf of his Nazi masters. Indeed, he has just returned from Prague, where he solved a murder at the villa of the late SS-Obergruppenführer Reinhard Heydrich, head of the German security services, even as an assassination plot unfolded against Heydrich. Back in Berlin, Bernie finds himself under the direct command of Minister of Propaganda Joseph Goebbels, also head of Germany’s gigantic UFA film studios, who has a personal assignment for him: track down the missing father of Croatian-German actress Dalia Dresner (Goebbels, a notorious womanizer, calls her “Germany’s Garbo”), neé Sofia Branković. Bernie falls hard for the beautiful Dalia, who returns his feelings, and sets off into the chaos of wartime Yugoslavia to find her missing parent. The passages set in war-torn Croatia are bone-chilling, not just because of the German SS troops, who routinely shoot first and ask questions later, but more especially because of the ultra-nationalist Ustaše militia, allies of the Nazis but unpredictably and prodigiously vicious. It is among these barely sane irregulars that Bernie finds Dalia’s father, once a priest, now a militia leader known as Colonel Dragan, famous for the speed with which he can slash Serbian necks. Goebbels and Bernie agree to lie to Dalia, telling the screen star that her father is dead. So far so good, but not long after Bernie’s fateful Yugoslavian trip, Dalia runs off to Zurich, where she plans to retire from films, live with her industrialist husband and perhaps enroll in university. Goebbels, who wants her to star in his next film – and just wants her – sends Bernie off to Switzerland to convince her to return. Zurich is much nicer than Banja Luka, and Dalia is adept at slipping away from her jealous husband for assignations, but the trip’s positive vibes go off-track as Bernie finds himself targeted by both Allen Dulles’s Special Operations agents and the Gestapo. It isn’t giving away too much to say he escapes with his skin intact – and with the girl – and manages to solve a years-old murder along the way. 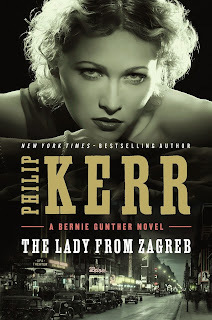 Kerr’s Bernie Gunther books – this is the 10th, counting The Berlin Trilogy as three novels, which it really is – make up one of the best series around, and his philosophizing, wisecracking hero is one for the ages. 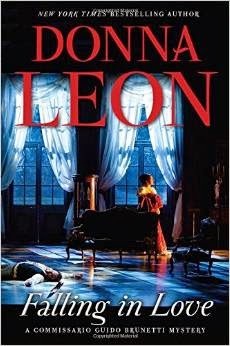 And speaking of excellent series featuring brilliant heroes, let’s not forget Donna Leon’s Venetian detective Commissario Guido Brunetti, whose saga has now reached 24 entries to go along with four other titles including 2013’s Gondola, a lavishly illustrated history of Venice’s trademark water vehicle. Leon’s most recent novel, Falling in Love (Atlantic Monthly Press), echoes two earlier entries: her first, Death at La Fenice, in which Italy’s pre-eminent soprano, Flavia Petrelli, is suspected of poisoning a famous conductor; and Acqua Alta, her fifth, in which Brunetti investigates the brutal beating of an old friend at the diva’s villa. This time, Petrelli – in Venice to perform the lead role in La Traviata – is being stalked by a mysterious admirer who has been trying to overwhelm her with enormous and numerous bouquets of yellow roses, and eventually, some very expensive jewelry. But things escalate beyond overenthusiastic fandom when a young singer is attacked after Flavia expresses admiration for her voice. Then other people close to Flavia are attacked, and Brunetti begins to fear that someone will die before the mysterious and anonymous admirer is revealed. All this time, of course, Brunetti is engaged in a peculiarly Italian version of office politics with his boss, Vice-Questore Giuseppe Patta, and boss’s right-hand man, Lieutenant Scarpa. Patta’s secretary, the all-powerful Signorina Elettra, aids Brunetti in his battles. This time, the Signorina is on strike against Scarpa, though no one else, due to Scarpa’s unfair suspension of a veteran officer. She will not complete Scarpa’s paperwork, pass on messages to or from him, perform any research for him or even talk to him. This amusing subplot continues through the entire novel, to a satisfying and perfectly Italian, i.e. convoluted conclusion.We also get to spend time with Brunetti’s delightful wife, son and daughter, usually over mouth-watering meals, and with his wife’s noble parents, whose gossipy conversation helps more than they know in solving the crimes their son-in-law investigates. The backstage scenes at the opera house are excellent, an unvarnished look at the grit and sweat behind the sets and under the costumes, the makeup and the lights. As the stalker’s aggression escalates, so do Brunetti’s and the diva’s fears. More of Flavia’s friends and acquaintances are threatened, or even attacked, and Brunetti is hard-pressed to stay ahead of the perpetrator. The ending is brilliant, taking place on the Traviata stage set at La Fenice, and with about as much drama as the opera itself. 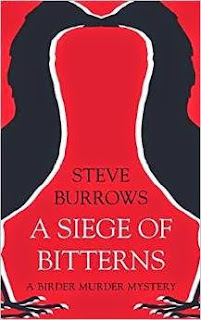 In Steve Burrows' A Siege of Bitterns (Dundurn) Canadian-born and -raised Detective Chief Inspector Domenic Jejeune comes to the Norfolk town of Saltmarsh with a shiny reputation earned by cracking a high-profile case in London, a beautiful journalist wife, Lindy, and a passion for birding that seems perfect for the seaside marshes in his new bailiwick. But before he can add anything to his life list of birds seen, he is called out to a gruesome murder: Environmentalist, author and TV personality Cameron Brae has been found hanging from a tree limb, with a bag over his head and his arms and legs chained. There are no suspects, no apparent motive and very little in the way of forensic evidence. Urged on by his superior, DCS Colleen Shepherd, who had gone out on a limb to hire him, and by the local MP, Beverly Brennan, Jejeune and his team, swing into action. But Jejeune’s insistent focus on local birdwatchers’ life lists – and of one of Brae’s notes that seems to indicate he has spotted an extremely rare American bittern –seems frivolous to everyone, including his boss and his team, especially the formidable DS Danny Maik. But the investigation moves forward nonetheless. At first, it seems no one has a bad word to say about Brae, known as The Marsh Man after his popular television program. But the deeper the police probe, the less clear-cut his reputation appears. He’s a difficult man to love, it seems, and environmentalism is as prone to professional jealousy as any other profession. The list of possible suspects comes to include Brae’s gunsmith and activist son, his ex-wife, his current wife – the much-younger pop singer and “party girl” Mandy Roquette – rival birders, an academic environmentalist envious of Brae’s media profile, and two businessmen/developers who have come into conflict with him over the years, particularly one who wants to drain the area’s signature salt marsh to accommodate more wind-powered turbines. Another death complicates the investigation, and extends the list of possible suspects. But Jejeune manages to negotiate the complex local relationships and webs of obligation and influence successfully, and to win over his new homicide team as well. And as it happens, the behaviour of a flock of rooks – more properly a “clamor of rooks” – provides the clue that leads to the wholly unexpected conclusion. 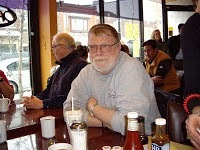 - Jack Kirchhoff is a writer and editor in Toronto.